The News Agency of Nigeria (NAN) reports that the new set of returnees arrived at the Murtala Muhammed International Airport, Lagos aboard a Buraq Airlines with Registration Number 5A-WAC at about 5.39a.m. 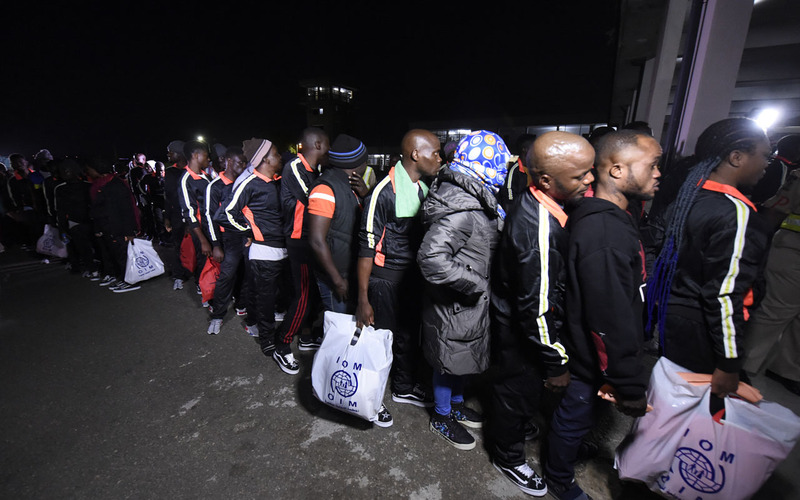 NAN reports that no fewer than 3,000 Nigerians have voluntarily returned from Libya through the IOM supported programme in the last few months. Maihajja, represented by Alhaji Suleiman Yakubu, the South-West Zonal Coordinator, said that the Nigerians returned in various batches between Dec.5 and Dec.15 with the assistance of the International Organisation for Migration (IOM) and the European Union (EU). According to him, the figure has already surpassed the 1, 295 Nigerians who voluntarily returned from Libya in the month of November. Maihajja said that the Federal Government would continue to work with the international organisations to ensure the return of more Nigerians from Libya where they had been facing severe hardships and rights violations. They comprised 46 adult females, 60 adult males and 10 children and infants respectively. Also, on ground to welcome the returnees were officials of the Nigerian Immigration Service (NIS), National Agency for the Prohibition of Trafficking in Persons (NAPTIP), Federal Airports Authority of Nigeria (FAAN) and Police.